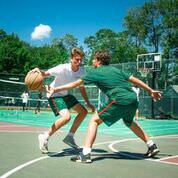 We offer a host of different team sports for campers. We focus on individual skill building during activity periods. But, we also offer supplemental games and competitions in which to practically apply those skills. Soccer/Football and Soccer Academy: [View Video] Excellent camper players from 20 countries and talented foreign coaches. 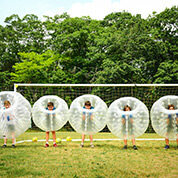 Interest in soccer at Robin Hood is passionate and soccer is our most popular and best coached team ball sport in camp. • Game play on two fields with matches daily. 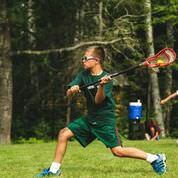 Lacrosse: Non-contact lacrosse skill building training is available for both boys and girls for beginner to competitive level players. 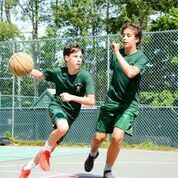 Basketball: Two coaches work with players to develop skill building in ball handling, shooting, rebounding, play making, speed and quickness, game strategy, conditioning drills, and how to develop an explosive offensive first step. Baseball: Private batting, fielding, pitching, and base running coaching available for players aspiring to advance to the next baseball skill level. Volleyball: Beach volleyball has recently been added to our program. Street Hockey: Available for playing during Afternoon Activity periods. Field Hockey: Girl’s-only field hockey has been recently added to theRobin Hood program. Flag Football: Available for playing during Afternoon Activity periods and Campfire Activity periods. Ultimate Frisbee: Available for playing during Afternoon Activity periods and Campfire Activity periods.